Vintage kitchenware and cookbook collector Jaymie Leighton has been estranged from her high school best friend Kathy Cooper since they were teenagers, but she never knew what turned Kathy against her. After fireworks at a Fourth of July picnic, Jaymie discovers the body of her former friend in the park. On the ground nearby is Jaymie’s own Depression-era glass bowl, broken in two. What a wonderful cozy. This one really kept me guessing. The killer ended up being someone you wouldn't suspect at all. Once this book grabbed my attention, I didn't want to put it down. This book is filled with wonderful characters, and pets, and I really liked the small town feel. Jaymie was so down to earth and charming. She is someone I would like to meet. I definetly want to visit Queensville and Jaymie Leighton again. Great job Victoria! 1. When did you start writing and what are your inspirations? I was just a kid when I started writing. At first I wrote weird little short stories influenced by the science fiction that read. Eventually, though, I realized that I loved mystery novels more than any other genre. I read a lot of Agatha Christie and Dorothy L. Sayers growing up, as well as other mystery authors. I tried my hand at a mystery novel and wrote one, then started to send it out to publishers. That was back in the dinosaur age before computers and the internet, so it was typed, using a carbon for every page to make a copy, and with whiteout corrections. It was awful of course, but I got enough encouragement that I kept writing. At some point I realized that the romance market was much more open to new writers, so I wrote a Regency – the sub-genre I read all the time – and found a small publisher who wanted to publish it. From there I wrote another, and finally broke in to Kensington in their Zebra line of traditional Regency novels. 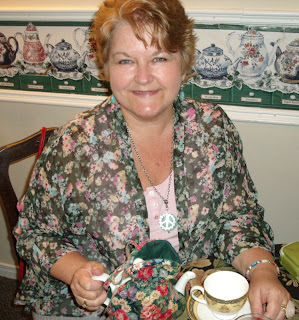 I wrote Regencies for several years, then paranormal historical romances, then a trilogy of historical romances. It was past time to make the move into my first love, though, and when I found my current agent, everything changed. Now I have three cozy series with Berkley Prime Crime! I’m a lucky writer. 2. Who did you base the character of Jaymie Leighton on? No one, really. Like most of my characters I took a snippet here and a snippet there to create a new person, one who collects what I enjoy, but whose life is completely different from my own! 3. Do you also collect vintage kitchenware and cookbooks like Jaymie? I sure do. 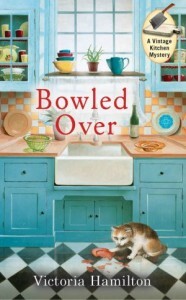 I love bowls, especially, and the murder weapon in Bowled Over, as well as the bowls on the cover, are from my own collection! I love old utensils and vintage table linens, too. I also enjoy vintage cookbooks and old handwritten recipes. 4. Is cooking a hobby of yours? If so, what do you most like to cook? I have been cooking most of my life and enjoy it a lot, though I would never want to be a professional chef. I like pasta dishes, casseroles, as well as muffins and cookies. In fact my love of muffins inspired my second cozy series, Merry Muffin Mysteries, set to debut September 3rd with Bran New Death! 5. Where did the inspiration for three legged Yorkie-Poo, Hopalong come from? I love dogs, even though I don’t have one. Neighbors of a friend have an adorable Yorkie, and I love the breed so much. I’ve always been touched by the valiant nature of amputee dogs and their owners, and horrified by the cruelty of puppy mills, and so, Hoppy (Hopalong) was born! If I could have a dog, it would be Hoppy! 6. How many more titles do you have planned for this series? Book 3 – Freezer I’ll Shoot - comes out on November 5th of this year. I wasn’t sure if it would continue on, but the series has been renewed and I have been contracted for two more Vintage Kitchen Mystery novels, so it will go on to Book 5, at least! I’m really happy about that, because I’m dying to know what happens to these folks! Thank you so much for having me on your blog! I enjoyed the questions. https://docs.google.com/forms/d/1wRNQWfMhr81HjiwZNXCuK4U6kNKomBW4PTgrYdZgeRY/viewform and the link to the post: http://cozymysterymarketing.com/?p=223. I enjoyed the interview, thank you. The book sounds great. The Vintage Kitchen and Merry Muffin series sound cute... will have to add to the ever -growing to-be-read list!